Adafruit has this week announced the arrival of a new addition to their online store and range of electronic hardware with the unveiling of the new Raspberry Pi Pimoroni Rainbow HAT for Android Things. The new Raspberry Pi Hat is equipped with a wide range of sensors inputs and displays allowing users to more fully explore Android Things. Once equipped to you Raspberry Pi the system can be used as a stopwatch, mood light, weather station, clock and more. 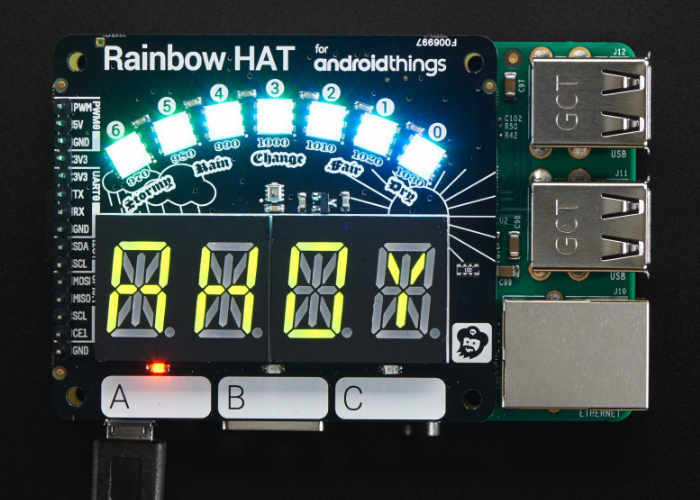 To create the new Rainbow HAT for Android Things, the team at Pimoroni worked closely with Google to create the extensive and on-board which provides the perfect introduction to developing Android Things applications on the Raspberry Pi. Adafruit explains a little more about what you can expect from the new Raspberry Pi HAT which is now available to purchase direct from their online store priced at $24.95. If you enjoy building Pi projects you might be interested in our comprehensive list of Raspberry Pi displays, HATS and small screens.